Thanks for the comments Chris and Pete. Pete, I will accept "Crawler" comment as long as it does not become "Creepy Crawler". Actually crawler is quite descriptive of operations in my shop. Because of the vision problems, if I drop a part I most often get down on the floor in baby crawl position with a flashlight to look for it. If that does not yield results I sweep the area and then look through the dustpan. This is also how the shop dog earns his keep. He generally keeps a close eye on me and when I drop something he goes over to sniff it to see if it is edible. That tells me where to look as I can see him. To give him incentive I will regularly "drop" a peanut or other morsel on the floor. And all of this gives me incentive to keep the floor swept up as chips and kneecaps do not get along wery well. New set up to drill the hinge pin holes. This operation will finish the track plates except that I later put a bevel of the groove for the sprocket clearance. 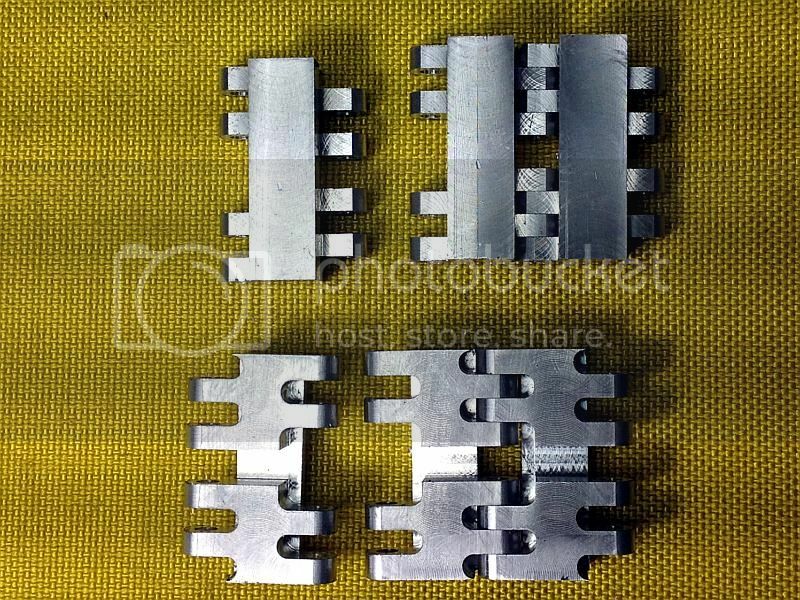 I dont think it is really necessary as the sprocket teeth will have a bevel on lthe ends of the teeth, but a little extra insurance that the sprocket will engage the track will not hurt. The drilling operation is a 3 step process. Four if you count the deburring ooperation that follows. The parts were set up in the vice withl a single parallel held against the moving jaw with a spring. This left a space under the holes with clearance for the drill/reamer to run into. 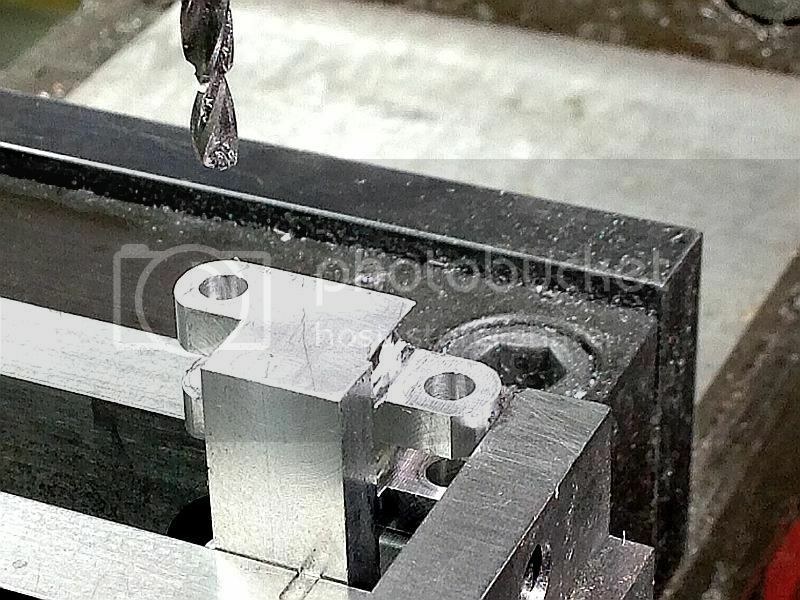 To teh right is a stop plate that is ground and perpendicular to the vice bed, The parts are put in the vice and pushed up against the stop with a pusher that is narower than the part and machined ned square on the end and rests on teh parallel. This is to make sure the art is vertical. All the parts were center drilled. The next operation was done with an 1/8 dreamer. As dreamers are not a common tool in most home shops I will explain a little bit. A dreamen is a combined drill and reamer. The tip is a drill bit with a length of about 3 hole diameters long. and a few thou smaller in diameter than the finished hole size. This transitions into a reamer that then finishes the hole to diameter. You can see the tip of the dreamer in the photo. The third operation was to open up the holes on the right side of the photo with a 0.127 reamer so there is a free hinging action. After alol of this the parts were set up as in the previous post and the tabs were all chased with the 1/8 inch end mill at high speed to remove all the burrs left by lthe drilling and reaming operations. This is quicker than hand deburring for me. I had not heard of the 'dreamer' tool before, clever setup. Chris, Sorry but teh computer had a glitch while I was posting and posted before I was finished. It has been edited and should be right now. Ant he pile of finished tread plates. Wow - now THATS a pile-o-parts! Thanks Chris. You and I both know about piles of parts. By the time you finish the chains on your suburb Lombard Hauler you will make my piles look small. Here is a test fitting of the track plates. Outside view on top and inside view on the bottom. 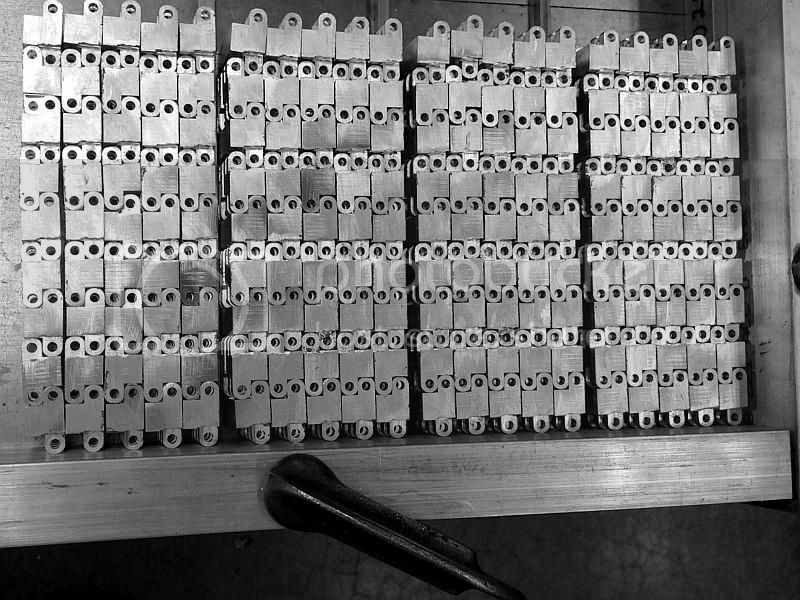 With the trqck plates complete, rollers are necessary to be able to assemble the tracks. These area simple drill and cut off operation. 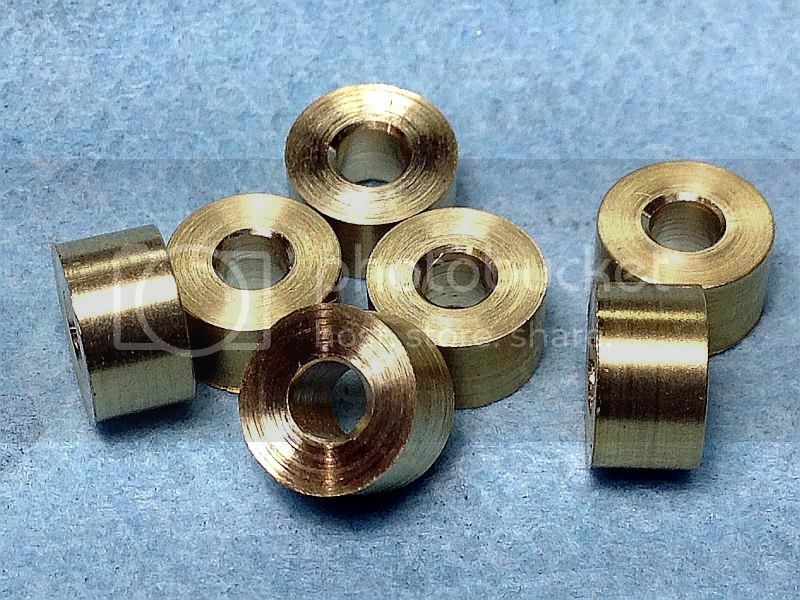 The rollers are 5/16 (0.312) diameter lx 3/16 (o.187) ling with an easy clearance hole for the 1/8 diameter hinge pin. I used a 3.2mm (0.126 inch) drill for the clearance hole. The were set up on the CNC lathe and took about 2 hours to run including the setup and programing time. I deburred the hole manually on the manual lathe running a small counter sinking tool in the lathe and holding the part in fingers. I was about able to keep up with the lathe so the parts were ready about 15 minutes after the CNC lathe wias finished. Hands and knees, flashlight, yep sounds like my shop sometimes... but my dog hasn't learned the chip sniffing thing and probably won't 'cause I never have food in the shop... I keep telling meself to figger out how to enclose the bottoms of everything so bits won't get under.. you'd have to see it..
Well come on in, the swarf is warm! 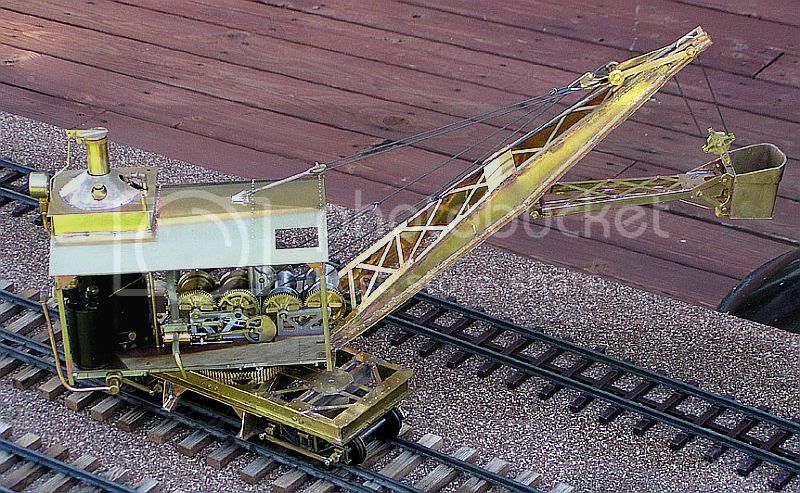 We got a couple of tractors going, time for you to build a tracked crane! Chris is right, Pete. Don't let us lhave all the fun, or insanity depending on how things are going. Besides cranes there are also tracked shovels. Here are two photos of my ditcher, which although is not a tracked vehicle did run on tracks. It is the same as a tracked version except the tracks are replaced with a self propelled railroad flatcar. And there were a lot more tracked versions built than ditchers so there is a lot information on them available. This really applies to this build as I spent several months trying to get sow speed - high torque clutches and brakes to work on it. It ran one one steam engine that ran all the time. All the hoisting drulms, slew movement and track movement were done with clutches and brakes. I tried disks, cones and a few other things and finally ended up with dog clutches and brakes for everything. A little jerky but not bad. Overall the ditcher took about 6 years to build. The crawler tractor will have all dog clutches and brakes except for the friction clutch that engages the engine ot everything else. It will be a manual friction clutch to dis engage the engine for starting.I may disengage it with a servo for gear shifts also. Still working out the details on that. So these photos do relate to this thread. NOW that is just so dam cute! A build thread on that would have been fun to follow! I don't think even you guys would understand just how passionate I am about things on tracks...both types!! Add steam to that and I'm smeared all over it. I'm struggling to keep the active projects to something I stand a chance of enjoying while I'm alive. That is one beautiful shovel, Gail. Sorry for the sideTrack on this thread, but Pete, do you know of sources for plans for early Cats? Thank you for the kind comments everyone. I want to be clear that the ditcher was a joint project with my friend Jim. Jim and I have been working on projects with each other for 20 or so years. The ditcher was our most ambitious project. Jim is not a machinist but can bend sheet brass like no one else I have ever seen. He also has a very artistic eye to make things look right. He did the research on the ditcher and made all the rough sketches to a "it chould be abllult this long" scale. I made the CAD drawings to something that was workable and machined the parts. 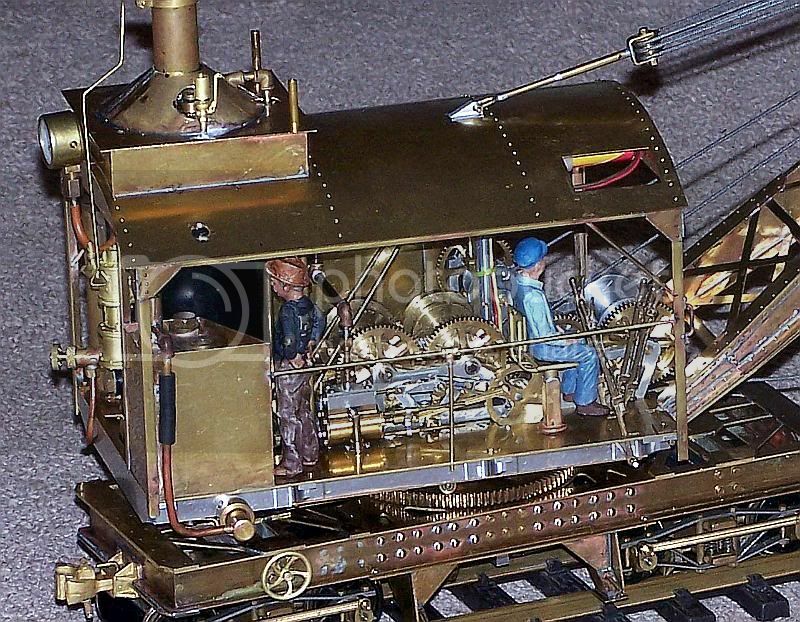 A lot of non functional detail parts were purchased as brass castings from Trackside Details. It was disassembled and reassembled many times to get things working right. The sorst part is that he lives a bit over 600 miles away. Since I can no longer drive we only see each other face to face a couple of times a year. Jim wii be helping me assemble the Hornsby Crawler. Pete, you probably know that the Hornsby Crawler was the grandfather company of CAT with the patents passed down through Holt and Best to eventually form CAT. Don't worry about if you can finish a project in your lifetime. Remember that it's the journey and not the destination that counts. I figure that this will be my last major project before being moved into the old folks home. Maybe I can take it with me and run it on the lawn there. And maybe I will be able to sneak in a few other smaller projects before then. Got to work fast. Bad Behavior has blocked 14928 access attempts in the last 7 days.